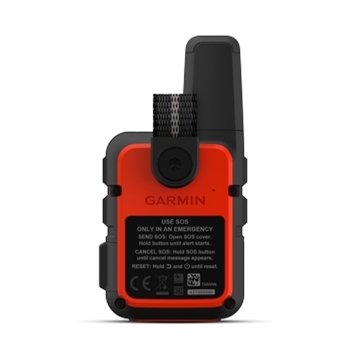 The Garmin inReach Mini is a super compact, Satellite Communicator with GPS that allows you to stay in touch while off the grid when paired with a compatible smartphone or Garmin product. 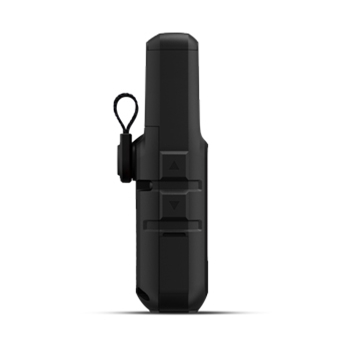 Providing two-Way communication, This small, rugged communicator allows you to send and receive custom or preset messages from a compatible smart device or Garmin connected wearable and handheld, only weighs 3.5 oz and won’t slow you down on your next adventure! Never be caught without being able to reach out to your loved one or call for help again. The inReach Mini offers complete Global coverage from Iridiums satellite network. The interactive SOS provides 24/7 contact to search and rescue Monitoring system. (Subscription required) Pair with your mobile device for access to US NOAA Charts, Aerial imagery and downloadable maps via the free Earthmate App. The Earthmate App also allows you to use all of the features of the inReach Mini right on your mobile device via Bluetooth. You’re also able to pair with compatible Garmin wearables like the Fenix 5S, 5, 5X, Quatix 5 and Forerunner 935 with the built-in wireless feature to remotely control your inReach Mini to send and receive messages. Get weather forecasts right on the inReach mini or on your paired device. There is a basic and premium weather package available. The Internal rechargeable lithium battery provides up to 50 hours of run time while in the 10 minute tracking mode. The included Mini USB cable allows you to connect with the Nocqua rechargeable battery pack below to get a quick charge while on the go. 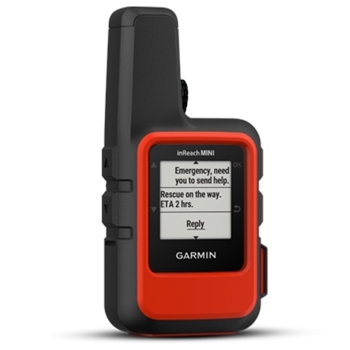 Click Here for more information on Garmin inReach Mini units and their subscriptions. Plans start as low as $11.95 per Month! Garmin’s Quatix 5 designed for the water and compatible with Chartplotters and other devices for Autopilot Control, waypoint marking, data streaming and more. 10ATM Water Rating, this stylish watch is built with GPS/GLONASS Receivers, elevate wrist based heart rate, includes boating features, activity tracking and much more! Garmin’s tactix Charlie combines a multifunction GPS watch with routable TOPO mapping for both the US and Canada. Rugged and water rated to 10ATM this all black watch can be worn anywhere anytime! Built-In GPS/GLONASS sensor and Elevate wrist-based HR! A top choice in back-up navigation while in the cockpit! The wrist-worn D2 Charlie from Garmin provides a crisp, clear color display that provides situational awareness and shows a view of airports, waypoints, terrain and more along your flight route. Pair with your smartphone for wireless and automatic flight logging! Garmin’s Fenix 5 MultiSports GPS watch is perfect for the avid outdoorsman. With Wrist Based Heart Rate and Multiple Sport/Activity Profiles the Fenix 5 is ready for adventure. Navigation and ABC Sensors Built In. The Fenix 5 Sapphire from Garmin is a rugged, scratch resistant GPS Watch. Ready for any outdoor or Fitness challenge, the sleek Black on Black look makes this easy to wear from the gym to the office and everywhere in between. WiFi Updates, Elevate Wrist-Based Heart Rate and Preloaded Activity Profiles are just the beginning. The Fenix 5 Sapphire with Metal Band is a rugged, scratch resistant GPS Watch. Designed with a Slate Gray Sapphire Display the Fenix is ready for any outdoor or Fitness challenge. WiFi Updates, Elevate Wrist-Based Heart Rate and Preloaded Activity Profiles are just the beginning. Garmin’s Fenix 5 Sapphire Performer Bundle packages the Fenix 5 Sapphire with Garmin’s HRM-Tri Monitor which is designed for Tri-Athletes and stores Heart-Rate Data even when under water. WiFi Enabled, Scratch Resistant Sapphire Lens and GPS/GLONASS receivers. Garmin’s Fenix 5S is a smaller (42mm diameter) multisport GPS watch. With Wrist Based Elevate Heart Rate Technology, High Sensitivity GPS and GLONASS receiver and preloaded activity profiles, this watch is ready for any outdoor adventure or fitness challenge. Garmin’s Fenix 5X is the perfect combination for athletes and adventurers! Preloaded with Topographic and cycling maps as well as over 40,000 worldwide golf courses, this rugged wrist watch includes wrist based heart rate, GPS/GLONASS receivers, group tracking and so much more! Garmin’s Fenix 5X with Metal Band is sleek and stylish and the perfect combination for athletes and adventurers! Preloaded with Topographic and cycling maps as well as over 40,000 worldwide golf courses, this rugged wrist watch has a wrist based heart rate sensor, GPS/GLONASS receivers, group tracking and much more! Garmin’s Quatix 5 Sapphire with rugged, scratch resistant sapphire lens and Metal Band is built with GPS/GLONASS Receivers, elevate wrist based heart rate, includes boating features, activity tracking an more. Designed for the water the Quatix 5 is compatible with Chartplotters and other devices for Autopilot Control, waypoint marking, data streaming and more!